Tullaghoge: A Sacred Landscape of the Kings. Much has been documented about the political history and influence of the O’Neills of Ulster, but less has been written about their inauguration at Tullaghoge. Why was Tullaghoge important for inauguration? What took place in an inauguration ceremony? What was so important about the inauguration stone, that St Patrick blessed it? And what is important about conducting a sacred rite of inauguration? This blog discusses these questions, and asserts that the inauguration focuses primarily on a different kind of power at play, a power that is less about politics or military supremacy, and more to do with an inauguration as a sacred rite (as it is in many parts of the world), effectively granting a mandate of Divine power with which to rule and guide the people. In this context, it is possible to place Tullaghoge Fort as a place of importance and significance, one that was central to the people and their belief systems. It places Tullaghoge Fort as meaningful as the Hill of Tara in Meath, Emhain Macha in Armagh, Cashel in Tipperary and An Granian in Donegal, among others. The inauguration of the Irish Kings, a ceremony that had been taking place for millennia, had a common procedure throughout Ireland. There is a rich source of literature relating to inauguration ceremonies in Ireland; a ceremony which pre-dated Christianity, and carried out as a sacred rite. An extract by Joyce, (1906), on the topic is reproduced below[i]. “The Inauguration or making of a king, was a very impressive ceremony. Of the mode of inaugurating the pagan kings we know hardly anything, further than this, that the kings of Ireland had to stand on an inauguration stone (at Tara called it is called Lia Fail, which uttered a roar, when a king of the old Milesian race stood on it). But we possess full information of the ceremonies used in Christian times. The mode of inaugurating was much the same in its general features all over the country. There was a definite formula, every portion of which should be scrupulously carried out in order to render the ceremony legal. Some of the observances descended from pagan times. Each tribe, or aggregation of tribes, had a special place of inauguration, which was held in much respect—invested indeed with a half sacred character. It was on the top of a hill, or on an ancestral carn or on a large lis or fort, each tribe used an inauguration stone. Some of the inauguration stones had the impression of two feet, popularly believed to be the exact size of the feet of the first chief of the tribe who took possession of the territory. On the day of the inauguration the sub-chiefs of the territory, and all the great officers of state, with the brehons, poets, and historians, were present, as also the bishops, abbots, and other leading ecclesiastics. The hereditary historian of the tribe read for the elected chief the laws that were to regulate his conduct; after which the chief swore to observe them, to maintain the ancient customs of the tribe, and to rule his people with strict justice. Then, while he stood on the stone, an officer—-whose special duty it was—handed him a straight white wand, a symbol of authority, and also an emblem of what his conduct and judicial decisions should be—straight and without stain. Having put aside his sword and other weapons, and holding the rod in his hand, he turned thrice round from left to right, and thrice from right to left in honour of the Holy Trinity, (Prior to Christianity, moving three times clockwise, and three times anti clockwise was held to open sacred energy), and to view his territory in every direction. Then one of the sub-chiefs appointed for this purpose pronounced in a loud voice his surname—the surname only, without the Christian name—which was afterwards pronounced aloud by each of the clergy, one after another, according to dignity, and then by the sub-chiefs”[ii]. The assertion of the divine right of kings, or divine-right theory of kingship is that the king is subject to no earthly authority, deriving the right to rule directly from God. This assertion dates back to the ancient civilisations of Egypt. The king is thus not subject to the will of his people, including (in the view of some, especially in Protestant countries) the Church. According to this doctrine, only God can judge an unjust king. So, concepts of royalty, coronation and deity were often inexorably linked. In some ancient cultures, rulers were considered to be divine or partially divine: the Egyptian Pharaoh was believed to be the son of Ra, the sun god, and while in Japan, the Emperor was believed to be a descendant of a sun goddess. Inaugurations were seen as a direct visual expression of these connections. The Divine right of Kings and the importance of inauguration as a sacred ceremony is therefore not unique to the UK and Ireland; it is common around the world[iii] In addition to investing the monarch with symbols of state, Western coronations have often involved anointing with holy oil. Wherever a ruler is anointed in this way, as takes on an overtly sacred significance. Such acts symbolise the granting of divine favour to the monarch. In England and Scotland, the textbooks of the divine right of kings were written by James VI of Scotland before his accession to the English throne. James I based his theories in part on his understanding of the Bible. There are no substantive written records to St Patrick visiting Tullaghoge to bless the inauguration stone, it being a time of oral records. What records there are, conclude that he visited there to bless the inauguration stone, and we know that he visited and stayed at other places nearby, for example, staying overnight at Coney Island. However, it is known that Pope Gregory instructed his missionaries to occupy the pagan sites in Europe, and to assimilate the power they contained into the Christian faith. There are references to these practices being undertaken by St Patrick in Ireland, for example, at the Druid Chair at Altadavin, and in the conversion of Donairt to Christianity, naming him as the guardian of the holy mountain (Slieve Donard). It would not be surprising that Patrick would have visited Tullaghoge to Christianise any practices being undertaken there, and to assume the power therein there for Christian purposes as part of the conversion of the people. This would also indicate that Tullaghoge was a significant and powerful site for hundreds of years before the inauguration of the O’Neill. More than likely, the power and the sacred ceremonies conducted there pre-dated Christianity. Though this term is usually concerned with something that is regarded as holy, devoted to a religious ceremony, it also refers to something worthy, or simply worthy of awe and respect. It includes an object or place that is set aside for a particular purpose can also be held to be sacred. So, while we speak in this paper of Tullaghoge Fort as a sacred place, as indeed it is, it is important that we also recognise that this does not necessarily have a religious meaning. And so, we recognise sacred and spirituality having a meaning that transcends religion, something that can be experienced by all people, regardless of faith or belief systems. Sacred sites captivate, inspire and generate wonder at their creation and mystery. What we also know is that many visitors feel something special and unique when they visit Tullaghoge Fort; for some, a feeling of connectedness to our ancestors, to the people who created and used the site, in others, a feeling of peace or of exhilaration, a connection to the unseen world, or to Divine power. 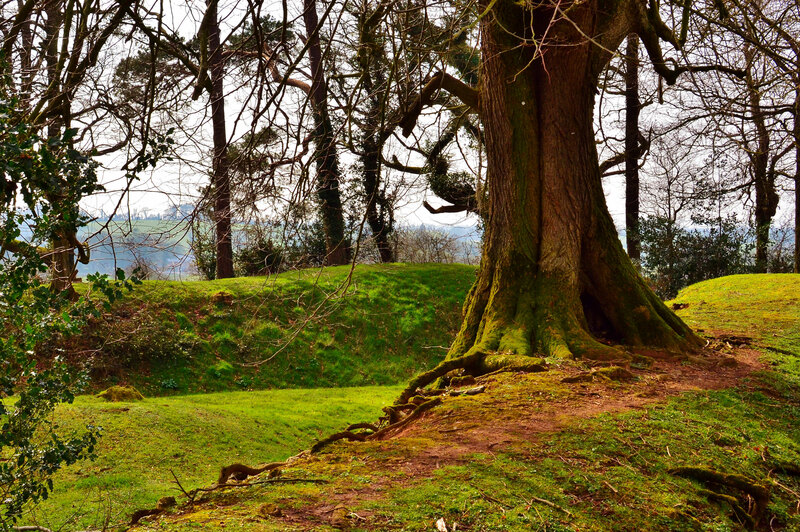 Tullaghoge Fort is a place of special energies where a living landscape is very evident; a place to experience awe and wonderment on an individual level. It is perhaps then, little wonder that the O’Neills chose this place for inauguration, for political and military power is one thing, it is quite another to capture the hearts and minds of the people through accessing sacred power, thus mandating their rule. As the chant of “O’Neill”, rang out in waves of sound across Tullaghoge Fort at their inauguration, who would deny that it was a God given power they had been vested in? In considering the importance of the O’Neill inauguration at Tullaghoge Fort, a place some miles away from their military base, it is equally imperative to place it within the context of the ancient (and modern) belief systems of the people. These belief systems include understanding the essential power of the landscape, its geomancy and its symbolism. It includes the ancient and modern belief of an inauguration as a sacred ceremony – ensuring that the recipient was divinely guided and ruled justly, as the ‘father’ of the land and his people. The history of Tullaghoge Fort indicates that it was already a place of some significance and power when Patrick blessed the inauguration stone. It is likely linked to Tara and other major royal and sacred sites in Ireland and as a sacred rite of inauguration, it has the special worth of the site as a place of spiritual power. A place that pre-dated Christianity, and as a special place it was vital, not only to the local people, but to Ulster, and to the island of Ireland; to its ruling powers.